Thanks to more than 200 rare or unpublished photographs from Russian archives and many testimonies of anonymous soldiers, In campaign with the Red Army immerses the reader in the heart of the "Great Patriotic War". This titanic struggle between 1941 and 1945 between the Soviet Union and Nazi Germany decided the outcome of the Second World War. 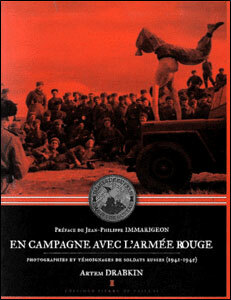 But this book reveals this Eastern Front in a completely new way: through the eyes of the simple Soviet soldier. Endless forced marches in the mud to personal hygiene in the cold, leisure - song, cinema ... - on the front to the deadly fights, he shows the reality of this long campaign of four years. An amazing journey, camera on board, with the Red Army.